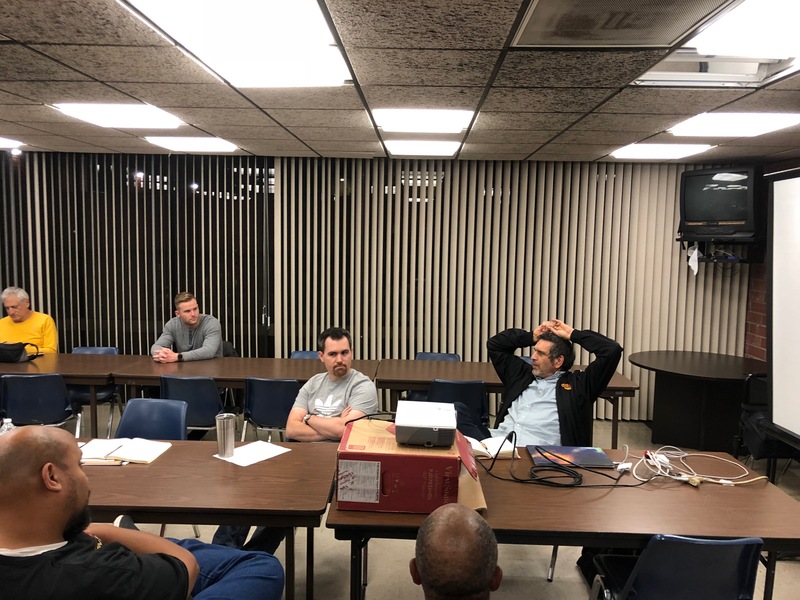 The RRS held our monthly meeting on Friday, November 9, 2018 at the Ken Nakaoka Community Center in Gardena. After coming to order and the reading of the treasury report, we discussed the agenda topics for this month. We were happy to be joined by new RRS member, Mike Albert. Results of the RRS educational event at Weigand Elementary School with the LAPD CSP program was very positive. The launch event at the MTA had an excellent turnout, good demonstrations and ten alphas flown. 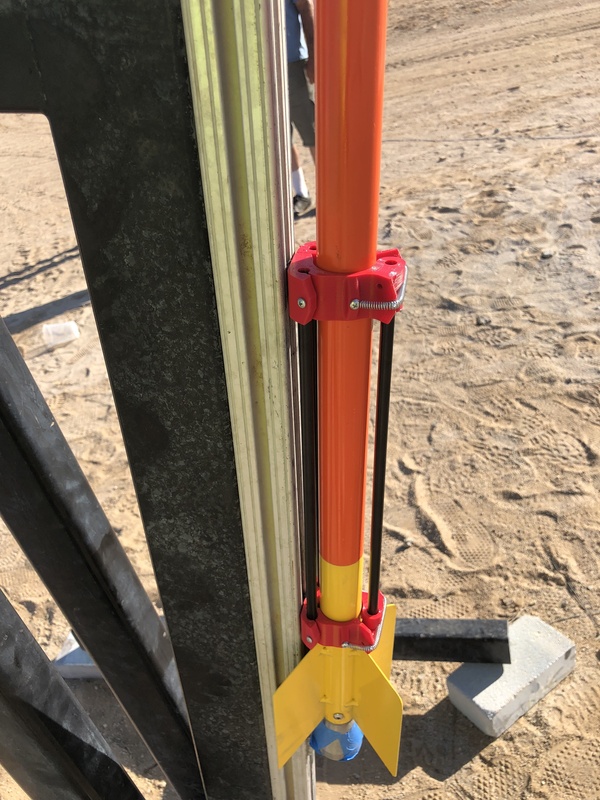 We are becoming more effective in our execution at launch day, but there are still opportunities to improve the speed of operations while keeping our focus firmly on safety. The weather in late October was ideal and we were able to enjoy the low winds and cool weather. With the low winds, the impact of all alphas were able to be heard and the timing by the kids showed the flight times to be very consistent. Many thanks to Osvaldo and Michael Lunny for doing a great job in packing them for what looked to be very good results. 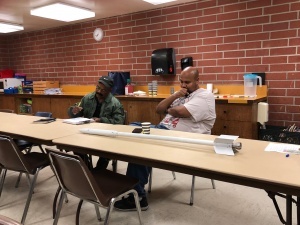 Frank is in the process of coordinating the next RRS educational event with LAPD to be a school affiliated with the Imperial Courts housing project which should begin in January 2019 sometime around the Martin Luther King holiday. The school will be announced soon once the details are finalized. The launch event will likely take place in March 2019. 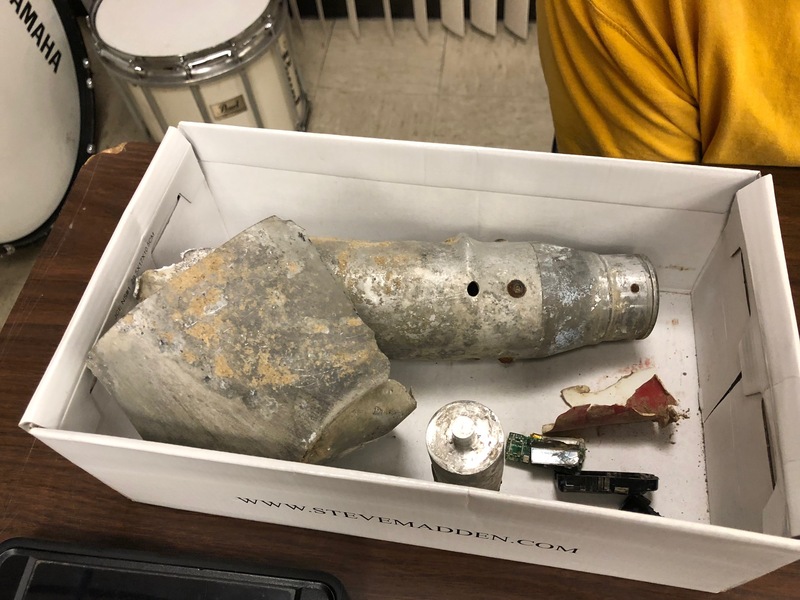 Results of Jack’s ballistic evaluation motor (BEM) testing were discussed. Jack and his team were not able to attend the meeting, likely due to the California wildfires in his area on that night. The testing rig had a few flaws and a missing part. It was unclear if any useful data came from the one test. Osvaldo is working with Jack on improvements to his BEM. A deeper discussion of Jack’s BEM will hopefully come at the next meeting. Results from the horizontal thrust stand testing were discussed. Despite the problems with the foundation slab sliding with the firing of the micrograin alpha rocket, the load cell did record data which partially confirmed the impulse bit measurements from the past. Many people enjoyed watching the footage, but in all seriousness, an appropriate mounting foundation needs to be made to continue tests. 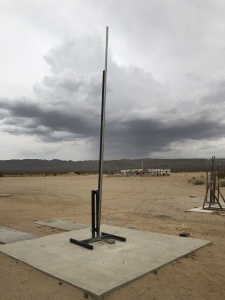 One proposed solution was to keep the existing shallow slab and drive a long stake into the ground to restrain the slab from moving south as the nozzle exhaust points north when firing. Another solution is to dig away the soil at the site and pour a deeper, rebar reinforced slab with the same 1/2″-13 female anchors. Keeping the slab low near ground level will keep this simple small foundation from preventing road access around the old blockhouse. The Additive Aerospace flyaway railguide was discussed. The device worked well with the micrograin alpha rocket. The fit was good and the camera footage from different angles showed the alpha in the railguide rode the full length of the rail flying very straight. The flyaway railguide did not survive its maiden voyage, most likely due to impact from the fall back to the ground. 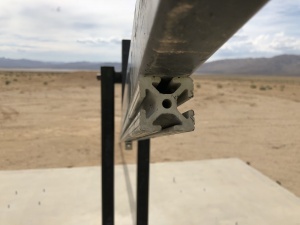 Also, there is a concern that using the micrograin rocket on the aluminum 8020 rail would eventually jam the rails with the zinc-suifide residue that coats the surfaces after each launch. The RRS needs to finalize the 2019 symposium date very soon. Frank and others consulted the local calendars of relevant organizations and schools and we have arrived at two possible dates in April. The announcement for the 2019 RRS symposium will be made very soon as invitations and preparations must begin very soon. We had a discussion of safety issues and propellant handling protocols during the meeting. The issue is complex and there are different opinions about what the RRS should require of our attendees and membership, but two points that were made clear is that safety is most important and that the RRS will seek to educate our membership about compliance with the applicable laws and best practices from our membership experience. 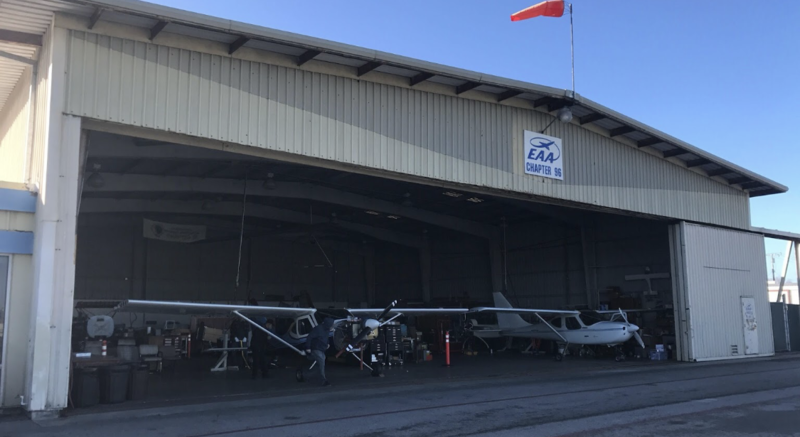 The RRS visit to the Experimental Aircraft Association (EAA), Chapter 96, at the Compton Airport on November 3rd was a success. 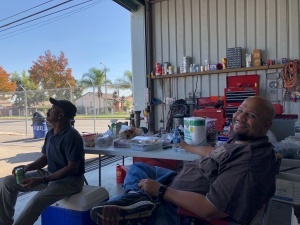 RRS and EAA member, Xavier Marshall, gave Osvaldo and I a good tour of the hangar and their machine shop. The EAA has several airplane projects in work including one by Wilbur Owens. 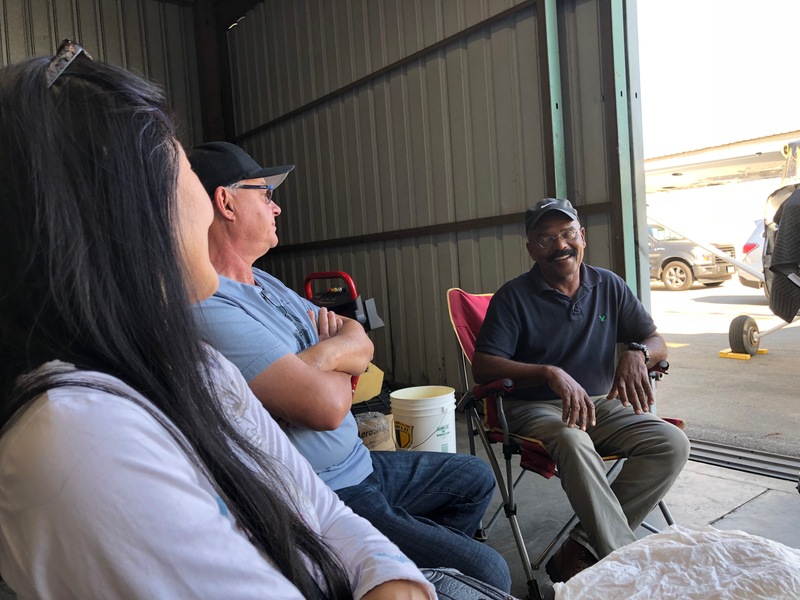 We ate lunch at Wilbur’s hangar and talked about future projects at the RRS including the standard liquid rocket. The visit concluded with a tour of Tomorrow’s Aeronautical Museum and their rocket laboratory. 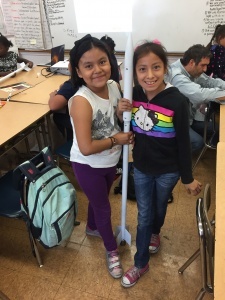 We visited with some of the students who were working on their rocket project. The RRS was glad to see a lot of enthusiasm for the science we love. The EAA membership is quite reasonable at $80/year. Members have access to the facilities at the hangar including the lathe, mill and metal shears useful for both aircraft and rocket structures. For those interested in joining the EAA, contact Xavier Marshall. The next order of business was the nomination of officers for the next calendar year by our administrative membership in attendance. The first step was appointing of the election chairman which will be Larry Hoffing. The prior executive council members were nominated to their same posts. Larry will email our administrative membership for their votes in the coming weeks. Write-in candidates are allowed. The election ballots will be due a week prior to the next meeting. Results of the election will be announced at the December meeting to be held on Friday, the 14th. 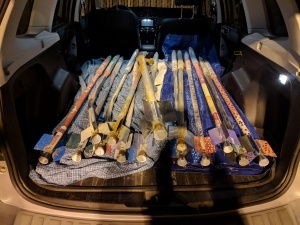 The RRS may have another launch event at the MTA, but this is dependent on confirmation of the appropriate resources needed to support the event. This will likely take place as soon as next week, or possibly on the Saturday after Thanksgiving. The RRS will post the formal announcement on the “Forum” of this website if the event becomes confirmed. 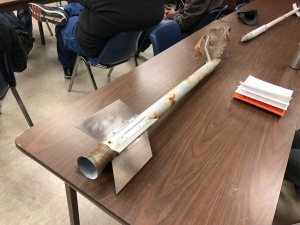 Osvaldo was up in Rosamond and was able to take a short trip to the MTA to extract more of the rockets he could find with his ratcheting extractor tool. 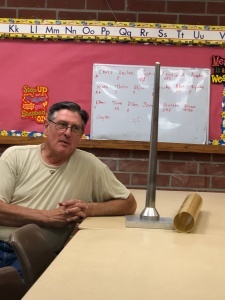 In addition to the 15 alphas he was able to bring back for refurbished parts, he found the beta rocket that UCLA had launched. This beta rocket had an altimeter payload encased in a vented metal shell. 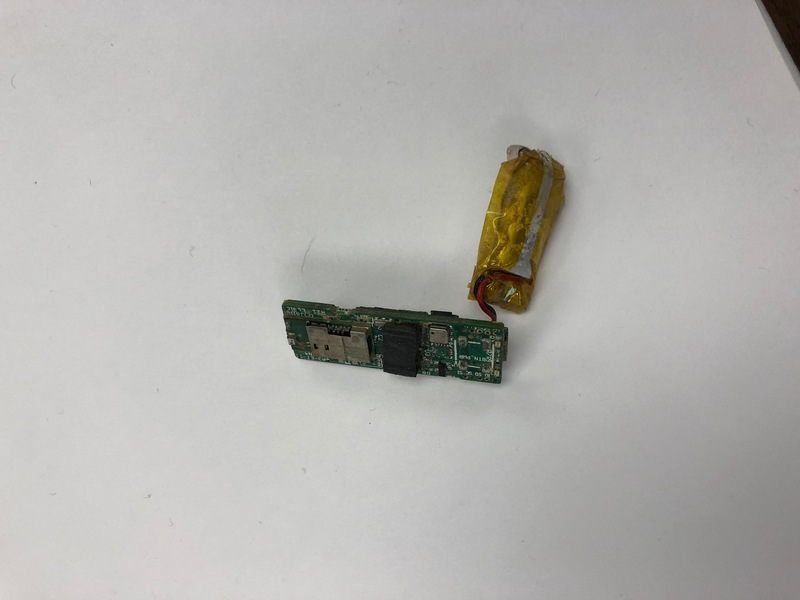 Unfortunately, the Jolly Logic bluetooth solid-state device might have survived the crushing impact but the corrosion from possible rainwater intrusion after being planted in the desert dry lake bed sand for over a year proved to be fatal. Chris Lujan is inspecting the device, but it is very unlikely that any data will be recoverable from the chip. It is a shame as getting direct measurements of a beta flight would be great data to have. I guess we’ll have to try again? 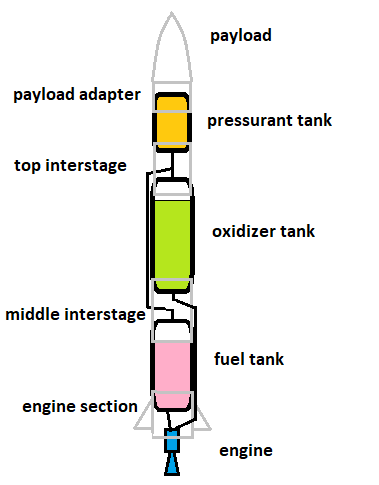 At the end of the meeting, I gave a brief overview of a second design for the RRS standard liquid rocket. The system is smaller than Richard’s initial 1000-lbf design and will use ethanol/LOX as propellants similar to prior RRS designs. 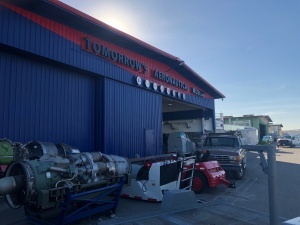 One of the key features is the custom-built aluminum tanks to be made from common piping sizes and head designs made from aluminum round stock on a lathe. In the last few minutes, I was only able to provide a cursory outline of the project which will be discussed in further details at subsequent meetings. I have identified a few of the key parts including high pressure solenoid valves, aluminum tubing, AN fittings and a common composite overwrapped pressurant vessel commonly used in paintball sports. Wilbur and Xavier mentioned that the EAA is open to having the RRS use their office for one of our monthly meetings in the future. Given how close the Compton Airport is to the Ken Nakaoka Community Center in Gardena, this is quite practical. The RRS will make the announcement soon if one of our meetings in early 2019 will be at the EAA 96 hangar. If there is anything here that needs correcting, please contact the RRS secretary. The next RRS meeting will be Friday, December 14th, 2018. 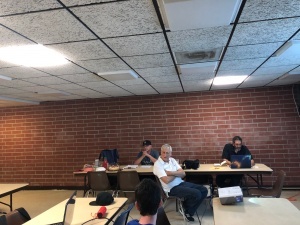 The RRS met for our monthly meeting on Friday, October 12, 2018, at the Ken Nakaoka Community Center in Gardena. As usual, we got started by calling the meeting to order and reading the treasury report. We had a big agenda but covered most of the topics. Richard Garcia wasn’t able to join us at the October meeting. He wanted to report that he has made some design improvements to the RRS standard liquid rocket. He’s finished upgrading his engine design code to be able to analyze a blowdown engine (pressure-fed from the tanks). He also will soon have drawings for a thrust chamber design. With some luck, I hope he’ll be back into testing at the MTA sometime soon next year. 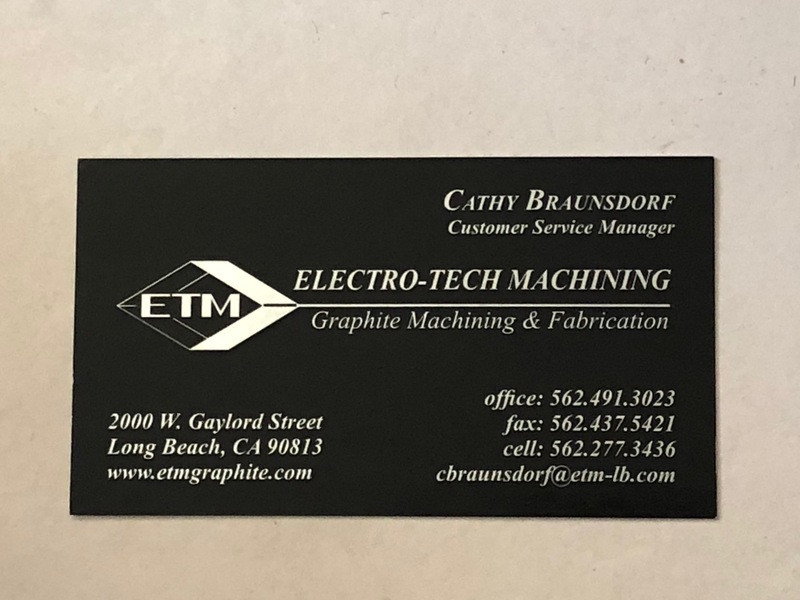 Electro Tech Machining (ETM) in Long Beach, California, specializes in graphite stock, graphite parts and Electrical Discharge Machining (EDM). 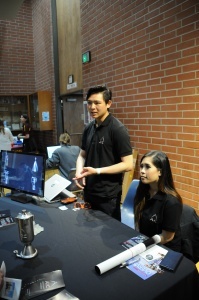 They are experts and have been a loyal supporter of amateur rocketry groups such as UCLA and USC. The Reaction Research Society is happy to endorse them as they have been a great support to our society member’s projects as well. Contact Cathy Braunsdorf at Electro Tech Machining. 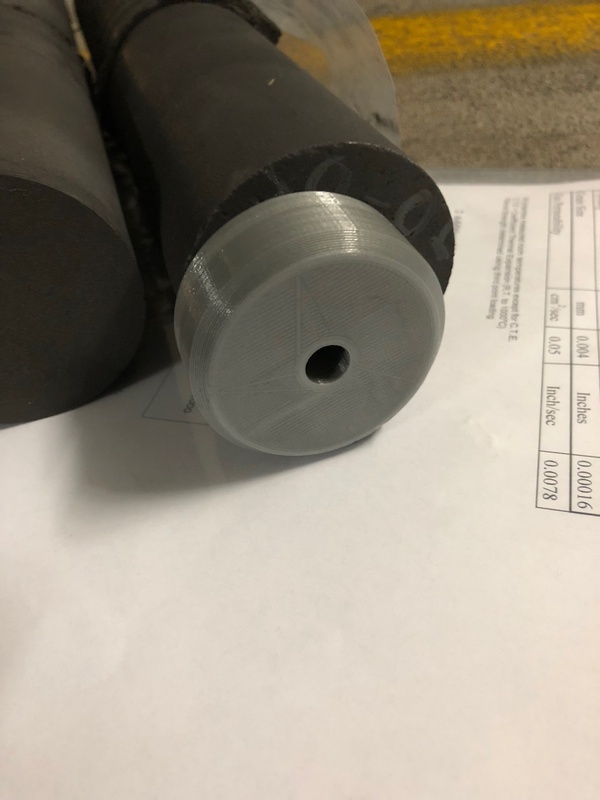 I stopped in this week to pick up some round stock for making more graphite nozzle pucks for the ballastic evaluation motor (BEM) that is nearing completion. Graphite makes an excellent high temperature material for nozzle throats or any low ablation surfaces. We have used graphite inserts into reclaimed alpha and beta nozzles over the years at the RRS. Our society members have used graphite throats in their larger solid motor tested at the RRS MTA back in June 2018. The latest educational event at Weigand Elementary school in Watts is going very well. The LAPD CSP program continues to help sponsor the event and we get great excitement from the kids. 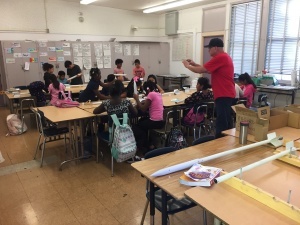 This Friday was the fifth of six educational events where they get to assemble the empty rockets. 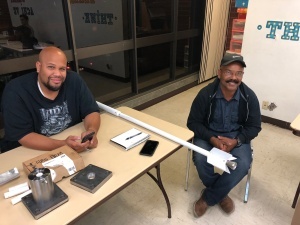 Osvaldo, Larry and Frank were on hand to help with the build process. 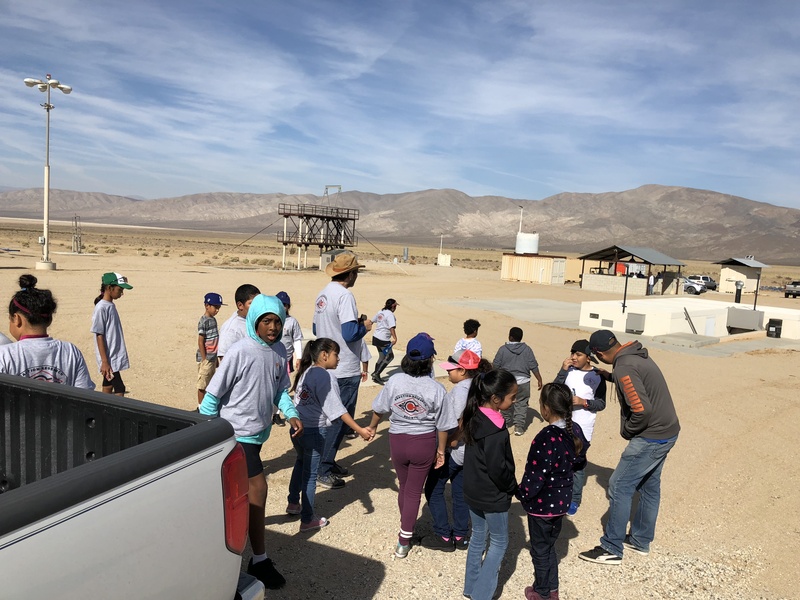 The kids are really enjoying the process of learning and painting the team rockets will done in the last session before going out to launch at the RRS’s private testing site, the Mojave Test Area (MTA). 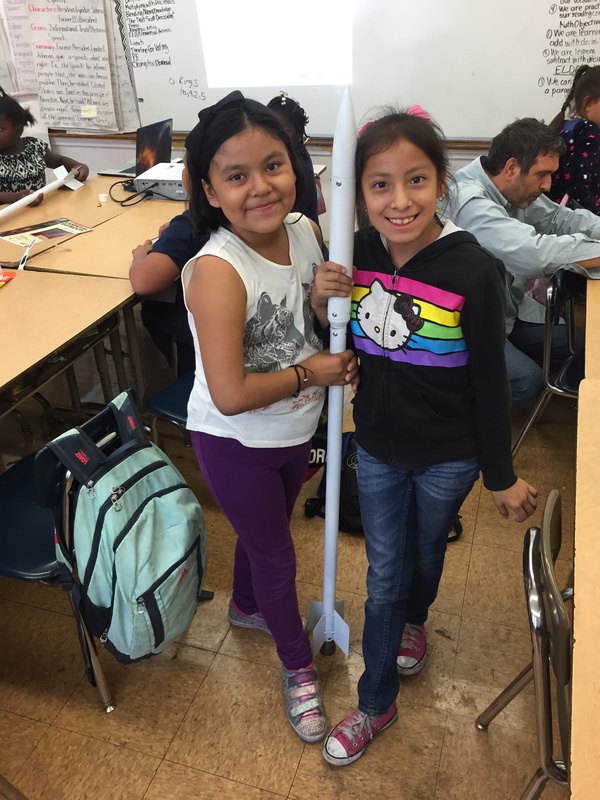 The next launch event at the RRS MTA will be the final step in the RRS’s educational program for Weigand Elementary school. We have this scheduled for October 27th and we hope to have cooler weather than in prior events now that the summer has passed. We have nine alphas from Weigand Elementary and three more alphas from our new membership, Wilbur Owens, Xavier Marshall and Michael Lunny. Xavier Marshall looks over his first RRS alpha, welcome to the club! 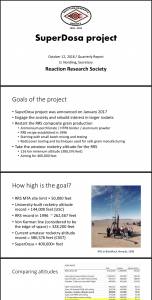 I gave my quarterly briefing on the SuperDosa project at the October meeting. This time, I organized my thoughts and ideas into a presentation to give the RRS a general overview of the project and where we are so far. Largely, I wanted to reiterate the project’s overall goals to many of the new members who have joined the RRS since the project’s inception in January 2017. 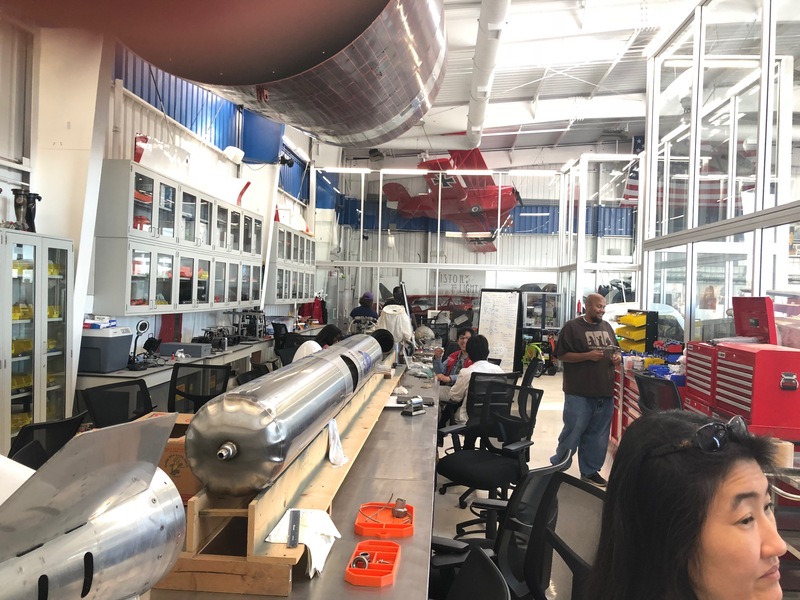 The RRS intends to retake the amateur rocketry altitude record and in the process reopen our ability to make larger solid rocket motors and expand our reach both in our own community and literally with payloads ultimately flying above the atmosphere. I also acknowledged the recent progress of some of our new members formerly of the Chaminade Rocketry Club. Also, USC had a launch attempt with their Traveller III rocket, part of their Spaceshot Initiative. Unfortunately, instrumentation was not functioning but the flight looked to be nearly perfect. I hope USC will come present their recent accomplishments at a future RRS meeting. (b) Begin prototyping instrumented dart payloads to practice flying and recovering these while getting good data. Making these devices work under the tight and unforgiving conditions that they must. Much of this prototyping work can be done at the MTA by flying smaller subscale vehicles and testing subsystems to prove they can work. More importantly, these tests give the society practice for the large vehicle testing which will reclaim the altitude record for the RRS. The response to the SuperDosa project’s progress was very constructive and many new ideas were offered. I’m thankful to Frank, Steve Majdali, Larry, Osvaldo, Bill Behenna, Drew and Xavier for their inputs. I have taken notes and given actions to other members who are willing to help advance key areas of the project. Unfortunately, this topic was to be the last of the evening as my presentation easily exceeded the 20 minutes I intended. 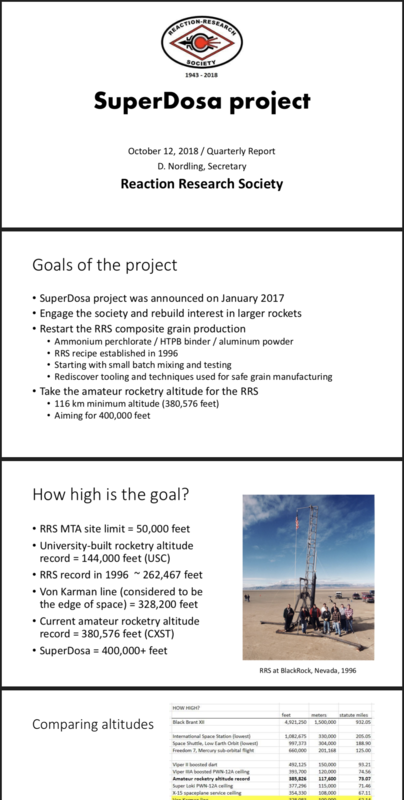 The next quarterly report for the SuperDosa project will be January 11, 2019, and I hope to report a great deal of progress. We had a last minute addition to the agenda, with Steve Majdali talking about black powder rockets and some very nice black powder rocket making tools he acquired while on travel. Black powder rockets are a classic form of amateur rocketry and involve many techniques that are broadly useful in other areas such as composite grain motors. Steve gave us a lot of great information specific to black powder making, pressing and a wealth of other practical information. Based on this new avenue of research, I felt the RRS would benefit more if Steve discussed this topic in more length in a stand-alone article soon to be published here on the RRS.ORG website. The RRS has been in contact with the Additive Rocket Corporation (ARC) of San Diego. 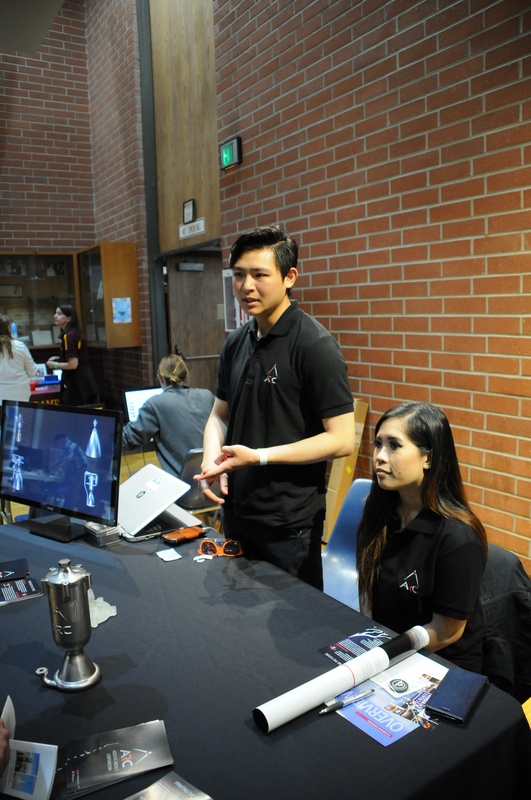 They are a startup company in San Diego with the goal of making high performance rocket motors using their novel design methodologies and 3D metal printing equipment. Discussions are still underway and thus there wasn’t much to tell. ARC was an exhibitor at the 75th anniversary symposium this year in April. 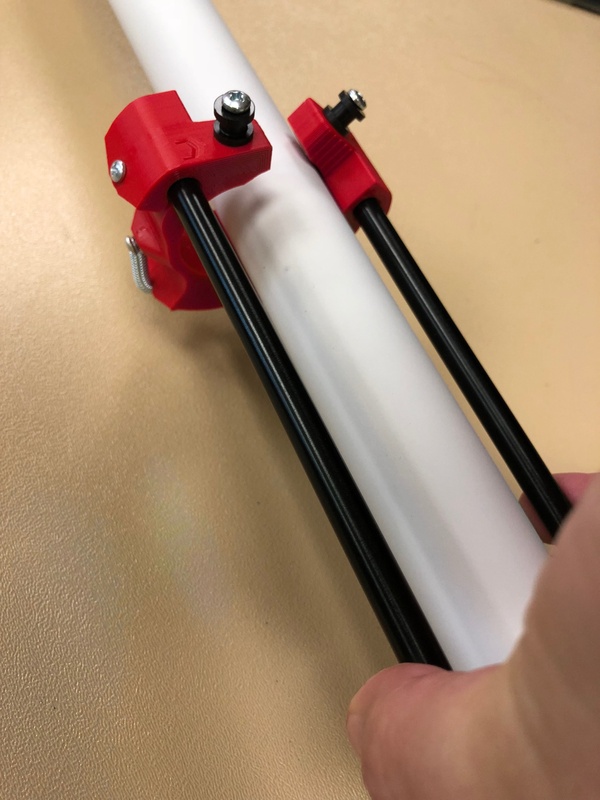 In my discussions with ARC, they were kind enough to offer to 3D print a simple small liquid rocket chamber I designed. Prices are not cheap, but this futuristic manufacturing technique offers a great deal of complexity that is not easily nor cheaply replicated by traditional means. I have been in discussions with ARC and hope to have more to present at the next RRS meeting. Alastair Martin could not join us at October’s meeting. I was going to have him discuss the current topics of interest at the recent 21st Annual Mars Society Convention held this summer. Alastair is very involved with the Mars Society and the RRS. Alastair will be at the November RRS meeting so we’ll put this topic on the next agenda. 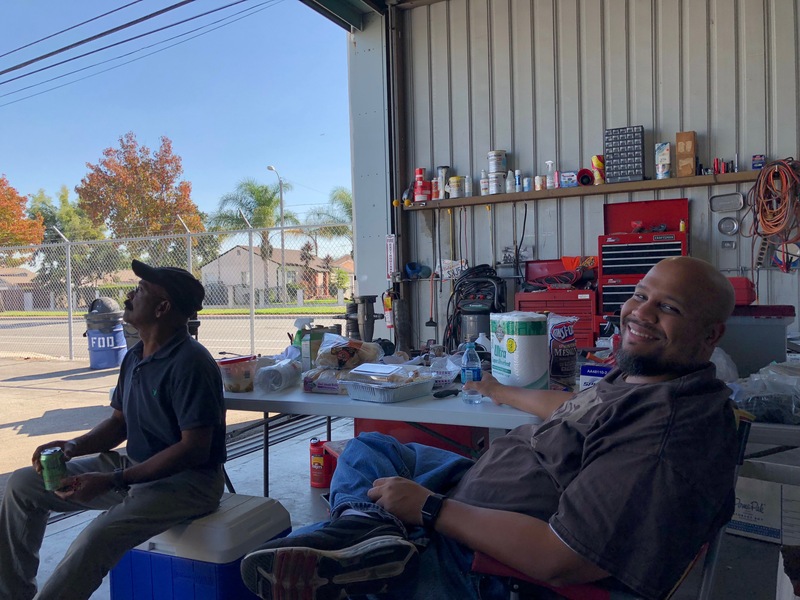 New RRS members, Wilbur Owens and Xavier Marshall, are active with the Experimental Aircraft Association, chapter #96, at the Compton Airport in the Los Angeles area. EAA-96 is a like-minded group of enthusiasts centered on experimental aircraft. The EAA-96 has hangar space and a range of machining tools offered to their members. Xavier had mentioned at the last meeting that the EAA would love to host a visit by the RRS. Accepting the EAA’s invitation, the RRS has scheduled a visit to the EAA in Compton on November 3rd at 10:00AM. The EAA will give an hour tour of their facilities and projects. We hope to foster a strong relationship between the EAA and the RRS. Talk with Xavier Marshall, Wilbur Owens, the RRS president, vice president or secretary for details. One of the key points of discussion at this visit will be to discuss how the RRS and EAA can help each other or participant in joint projects. 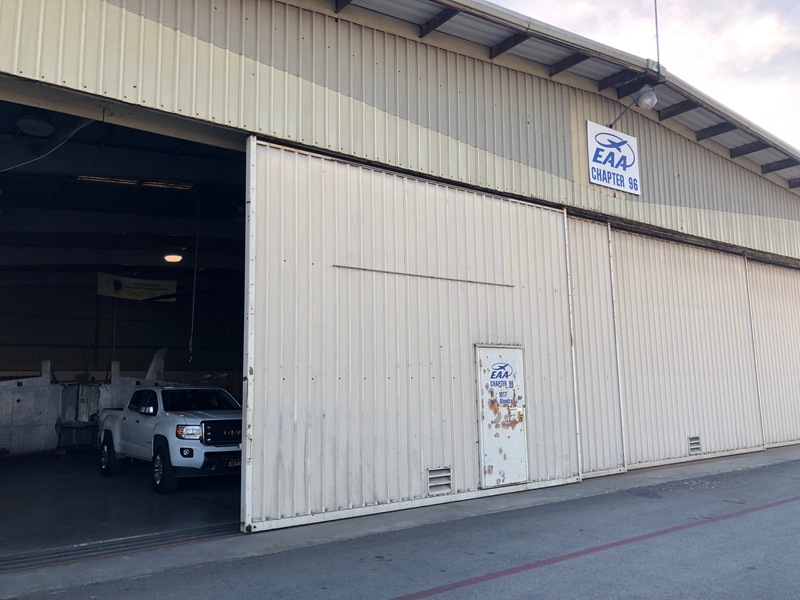 The RRS is interested in using the EAA hangar facilities if they are available. Annual membership at the EAA is $40 to the EAA national society and $40 more to the local chapter at the Compton Airport. As I understand but must confirm, with EAA-96 chapter membership, RRS membership can have access to the machining tools for building rocketry parts for those of us without facilities in our own homes. 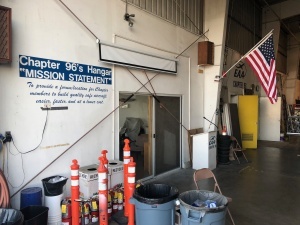 Xavier had also mentioned that hangar storage was often very cost-effective which could be a service that the RRS could use as we look to expand our shop capabilities to our membership. The EAA hangar is just straight east and not very far from our regular meeting location in Gardena at the Ken Nakaoka Community Center just north of Artesia Blvd. (CA-Hwy 91). The address is above. Osvaldo’s recent successful design of an alpha parachute recovery system was not able to be covered. We may expand this topic into a fully illustrated RRS.ORG article if we can not get this topic on next month’s agenda. This has been a quiet success and definitely worthy of exhibition to our membership. Jerry Fuller of Aerospace Corporation had indicated interest in building and testing a larger subscale prototype of his liquid-infused hybrid motor grain. 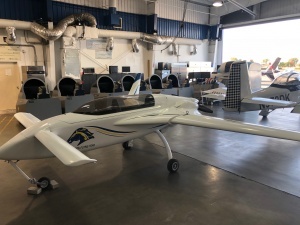 Aerospace had earlier this year successfully demonstrated a smaller prototype in flight at the RRS MTA. In choosing the next larger design, he has selected a common model rocketry size (98 mm) just under 4-inches which will allow him to use commercially available rocket body parts. Jerry is active with our friends at Rocketry Organization of California (ROC). At this time, he is still working on the design until resources can be allocated. The RRS has invited him to present his results and the new prototype he has in mind. The RRS is happy to support private groups with a testing area and a community of amateur enthusiasts happy to assist. The RRS had discussed having a small group of our membership go out to the next ROC event which is held the 2nd Saturday of the month. Unfortunately, neither I nor Drew were able to go this month. 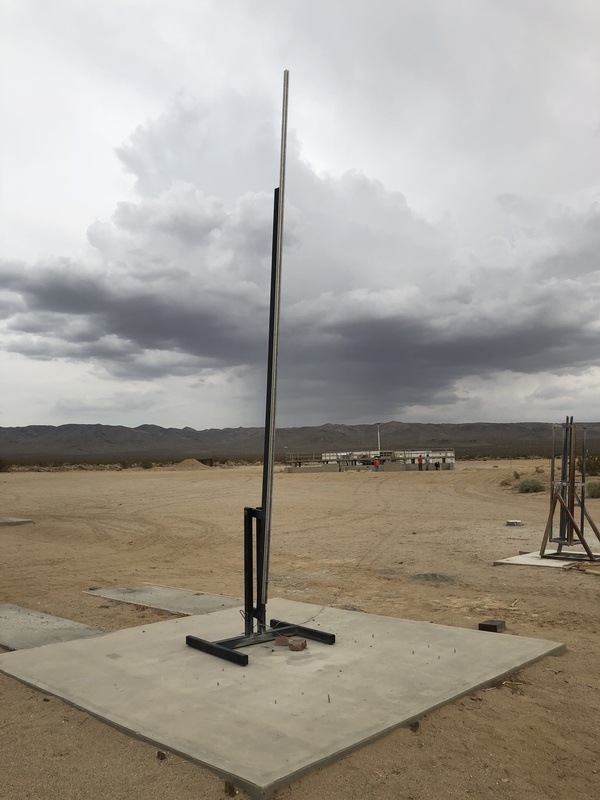 With the Friday night rains falling on the city, it might not bode well for the event at the Lucerne Valley as they must operate on the dry lake bed. We are looking to coming out to the November ROC event in the Lucerne Valley and hope we can bring other RRS memmbers with us. In particular, some of our members are interested in getting more practical experience through the NAR or Tripoli prefect at ROC. Moreover, some of the RRS membership is seeking experience and support as we acquire letters of recommendation for the California pyro-op licensing in rocketry. Saturday seminars have not yet been scheduled, but the RRS is still committed to offering an extended time period for fuller discussions by invited speakers. [+] RRS member, Jim French, is a speaker of which we would be very excited to have. Jim was a development engineer at the famed Santa Susanna Field Laboratory here in Los Angeles during the development of the reliable and powerful H-1 engine and the injector for the massive F-1 engine. Later, he worked at TRW on the reliable, hypergolic fueled, Apollo Descent engine at TRW at their San Juan Capistrano testing site (now defunct). His book, “Firing a Rocket Engine” is available on Amazon and it is a great read. 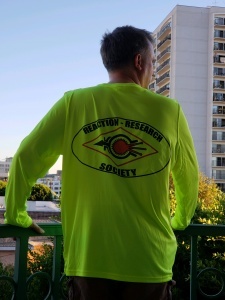 [+] Reaction Research Society founder, George James, is another speaker we have been wanting to have. 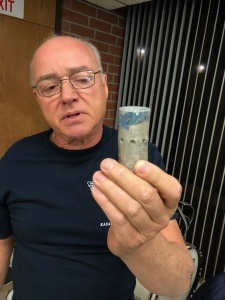 His founding work with his other organization, the Rocket Research Institute (RRI) was a great topic he covered only briefly at the 75th anniversary symposium in April. [+] Rocketdyne retiree and materials expert, John Halczuk, is another potential speaker on the subject of his extensive research of the V-2 rocket. He gave an excellent talk last year at California State University in Northridge, on history of the V-2’s development and deployment. The V-2 guided many design decisions still used in modern rocketry today in both the United States and particularly in the former Soviet Union. We were not able to discuss this topic in detail, but more information will be forthcoming, hopefully in the form of an announcement of our first Saturday seminar at the Ken Nakaoka Community Center on a Saturday morning. The next RRS symposium date in 2019 will be set soon. Based on the powerful success of the 2018 event, the RRS has decided to further the tradition one more year. We hope to have an even better mixture of universities, private companies and government agencies. There was no time to formally raise the subject, but it was decided by the council members present at the October meeting that the 2019 RRS symposium date will be formally set by an offline discussion and the date officially announced at the next RRS meeting on November 9, 2018. 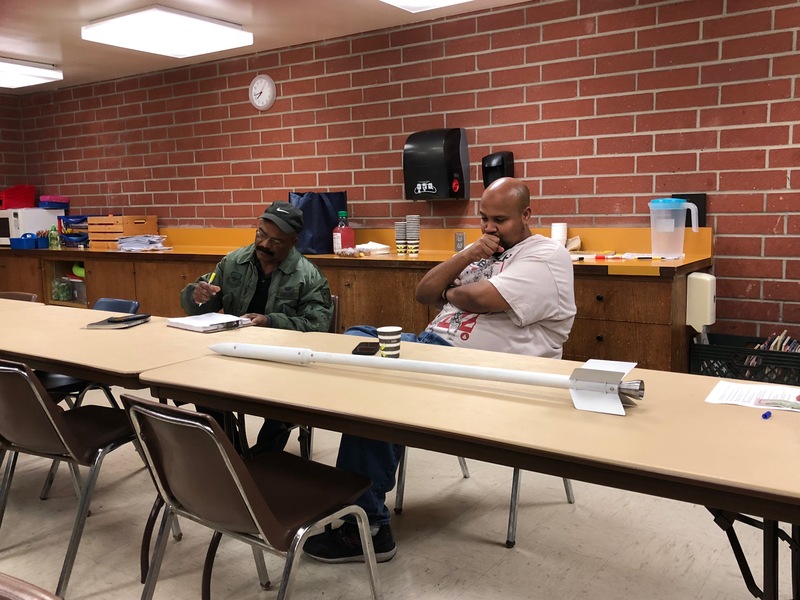 The next meeting of the RRS will be November 9th at the Ken Nakaoka Community Center in Gardena. We will most certainly discuss the results of the MTA launch event scheduled for Saturday, October 27, 2018. I will build the agenda starting at the end of the month. Please contact the RRS secretary for ideas and information on meeting topics. As per our constitution, the RRS will hold its annual nominations of officers for the next calendar year 2019 at the November 9, 2018 meeting. Voting by the administrative membership will take place thereafter and managed by our election chairman. Results will be announced at the next meeting on December 14, 2018. 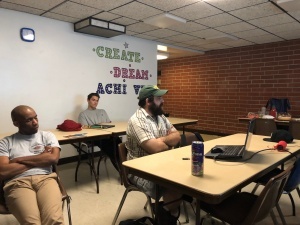 The RRS held its monthly meeting for September 2018 this Friday, the 14th, at the Ken Nakaoka Community Center. We were displaced from our usual meeting room, but got the upstairs room F with the window view which was pretty nice. We were well attended, but got a very late start. Meetings begin at 7:30pm. 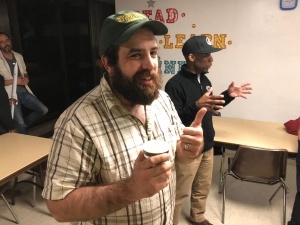 There were several little events at the meeting which did not make the agenda. The RRS was glad to welcome new student member, Bailey Cislowski. We had a short little social event at the end of the meeting which was a nice way to end the week. Also, the RRS was glad to re-welcome new members Wilbur Owens and Xavier Marshall. Wilbur had his first rite of passage in the RRS by taking his first standard alpha rocket. He’s looking forward to filling it with micrograin at the next launch event on October 27th. It will be one of many to come! Xavier invited the RRS to come tour the Experimental Aircraft Association’s local chapter at the Compton Airport. The EAA holds regular events including educational events with local kids. RRS member Alastair Martin is active with the Mars Society which just completed their 21st annual International Mars Society convention at the Pasadena Convention Center. If Alastair can oblige at our next RRS meeting, I have asked him to give the RRS a report on his experiences at the event. Besides film-making and photography, another one of Alastair’s talents is screen-printing on shirts. I recently had the RRS logo added to this bright-yellow shirt that I bought to better survive the hot Mojave desert climate of the RRS MTA. These bright-yellow “Ultra-Club” cool & dry shirts can be bought on Amazon in a variety of sizes besides the “XL” that I wear. 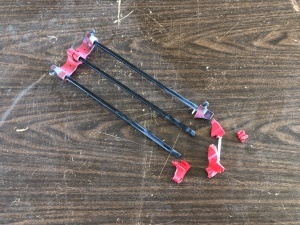 I recently purchased a fly-away rail guide from Additive Aerospace. 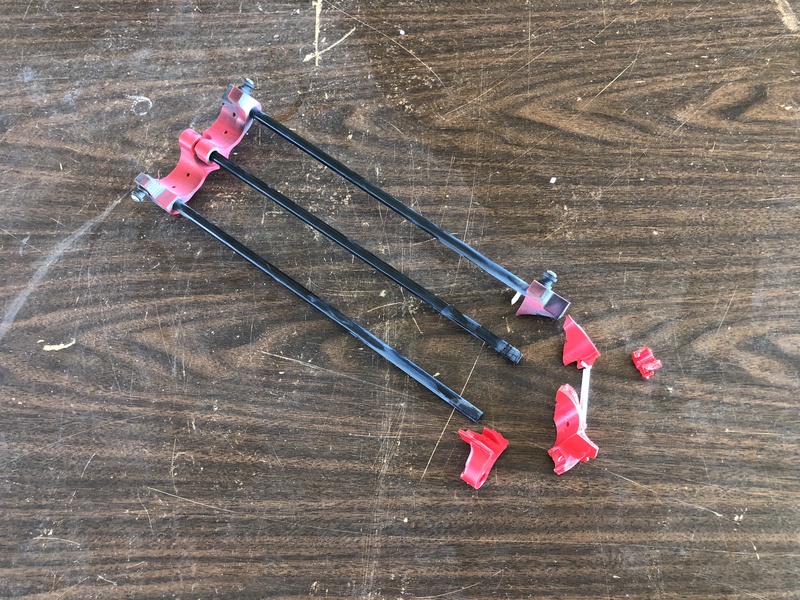 This company specializes in model rocketry parts including this simple clamp-on device that obviates the need for mounting rail buttons on the smaller rockets. Additive Aerospace was nice enough to customize their standard 38mm design to fit the slightly smaller (1.25″ diameter) RRS standard alpha propellant tube. 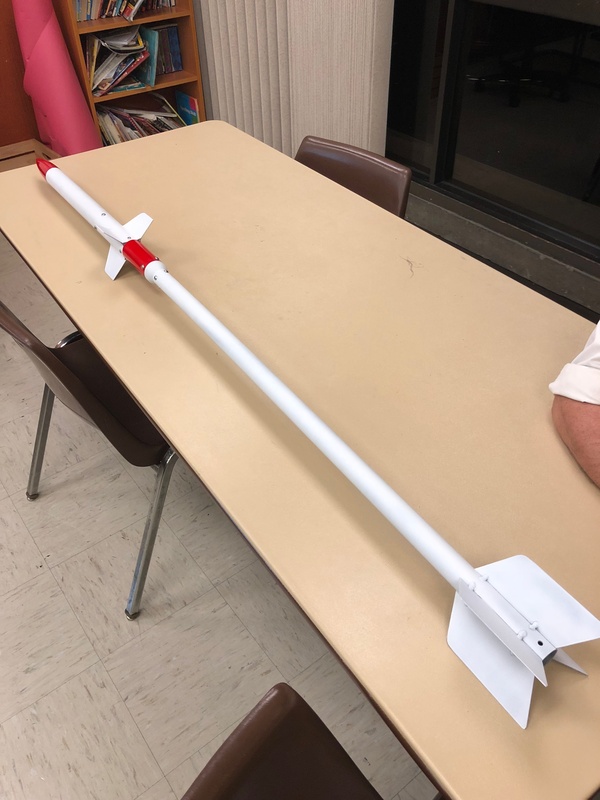 The fit check was perfect and the next step will be to attempt to launch an alpha from the 80-20 rail launcher we have. 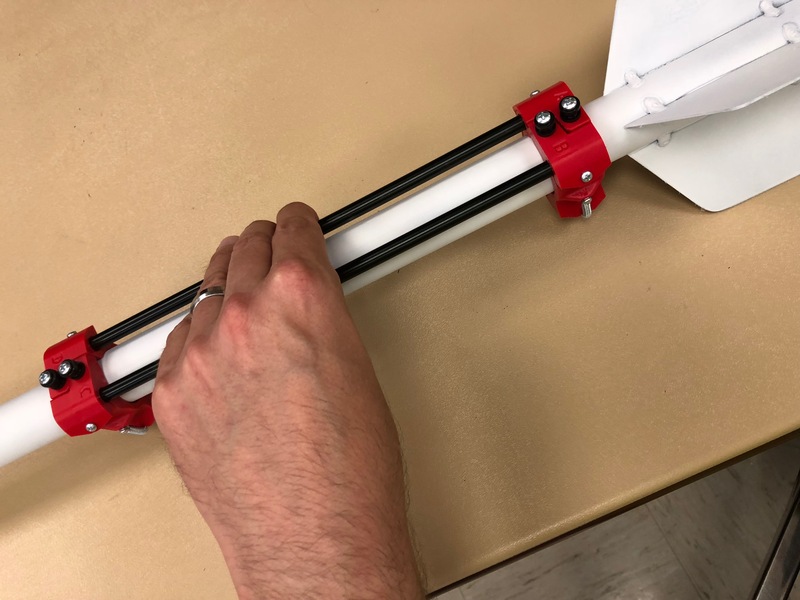 Flyaway rail guide customized for an RRS standard alpha micrograin rocket is a good fit (and held closed by my hand). Flyaway rail guide has two pairs of rail buttons to hold the rocket on the launch rail. Osvaldo completed the cylinder piece of the ballistic evaluation motor (BEM) assembly that I designed for testing the burn rate of solid propellant samples. I forgot to bring the graphite nozzle pucks that Richard Garcia made for the assembly. Once the gaskets are fitted and the pressure transducer is checked out, we can begin to prepare 4-inch long samples of propellant into the 3/4-inch PVC tubes for which the BEM was designed to fire. 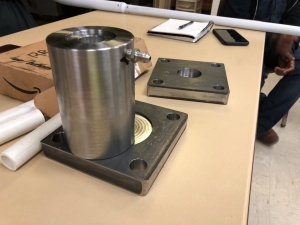 This will be a useful tool in characterizing the AP/HTPB/Aluminum solid propellant batches that will be used in the prototypes of the SuperDosa project. Larry has already made a small batch of the RRS standard recipe solid propellant. Some of these first grains may be used in the propellant burn demonstration at the next RRS MTA launch event. 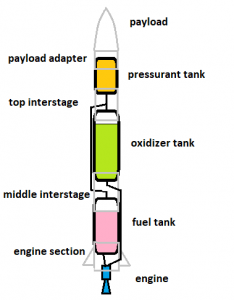 Thanks to Osvaldo again for his help with the two-stage alpha rocket that I designed. In this prototype, the payload tube was made longer for the possibility of a parachute recovery system for the upper stage. 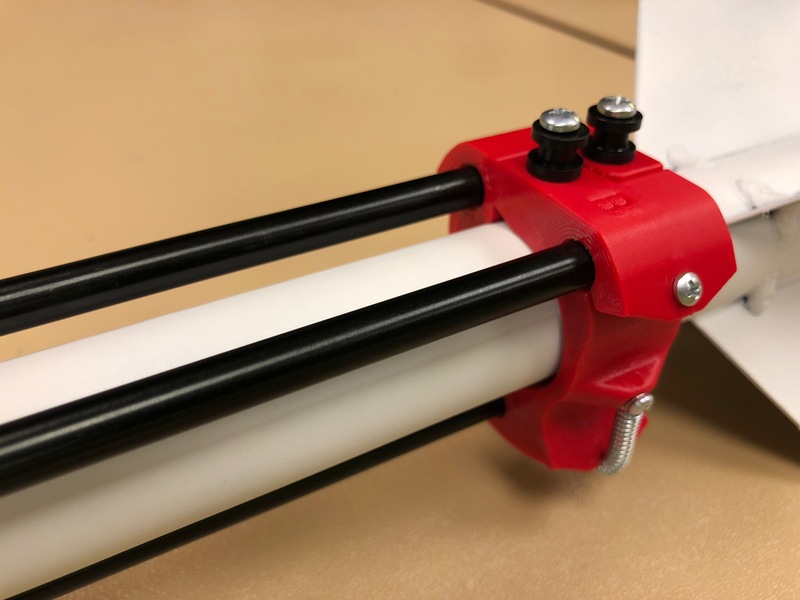 The 1-1/4″ PVC pipe was machined down to 1.600″ OD to fit inside of the standard alpha’s aluminum payload tube. 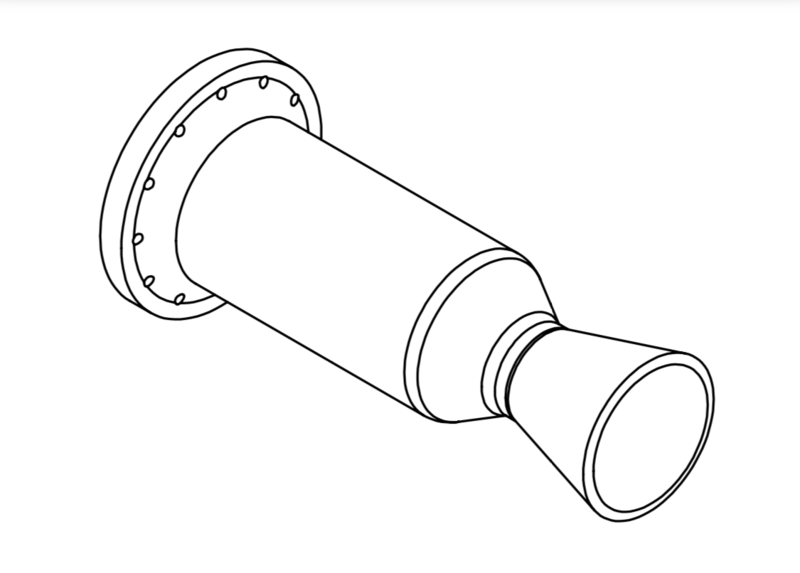 The steel nozzle design, although simpler to make, may prove to be excessively heavy and throw off the mass balance of the rocket. The graphite nozzle design with its split retaining ring may be the better choice. 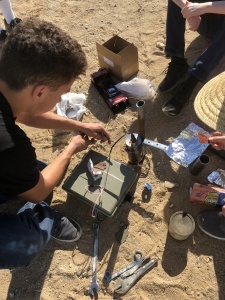 More work is needed before attempting to fly this prototype design including completing the inter-stage timer circuit for deploying the in-line second stage motor in flight. Since August, Osvaldo has made some progress in testing the load cell that will be used in the horizontal thrust stand. 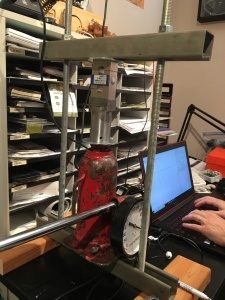 The bottle jack he used was tapped with an analog pressure gauge and the compression load into the load cell can be accurately measured. Despite some seal leakage problems with the older bottle jack, the results he and Matteo gathered from his data acquisition unit showed our S-type load cell matches the calibration sheet fairly well. 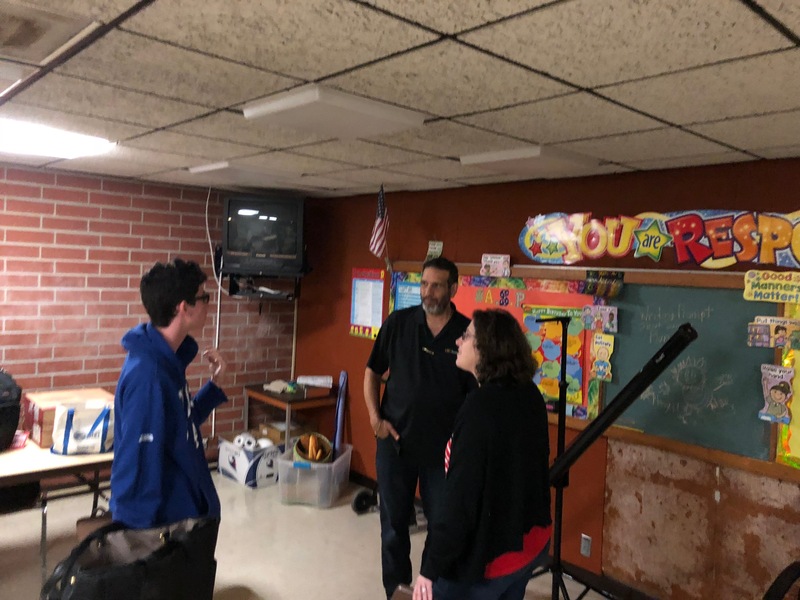 Frank Miuccio gave an overview of the next educational event that had its first event of the series held today at Weigand Elementary school. This is the latest in the series of events we’ve had with the LAPD CSP program. The final event will the launch of the alpha rockets at the RRS MTA on October 27, 2018. Dave Crisalli will be our pyro-op at the event. We didn’t have another launch event planned yet for this year, but it’s always possible. Richard Garcia gave a brief overview of his successful hot-fire test of his 1000-lbf kerosene-LOX motor on August 18, 2018. His pintle injector with an ablative chamber insert worked very well despite a leaking fitting at the LOX port. 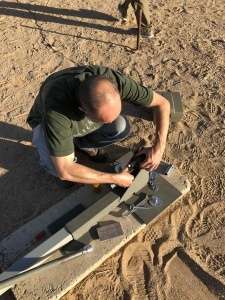 Some of the equipment did not work completely as hoped, but the overall test produced a stable thrust profile and clean cut-off. 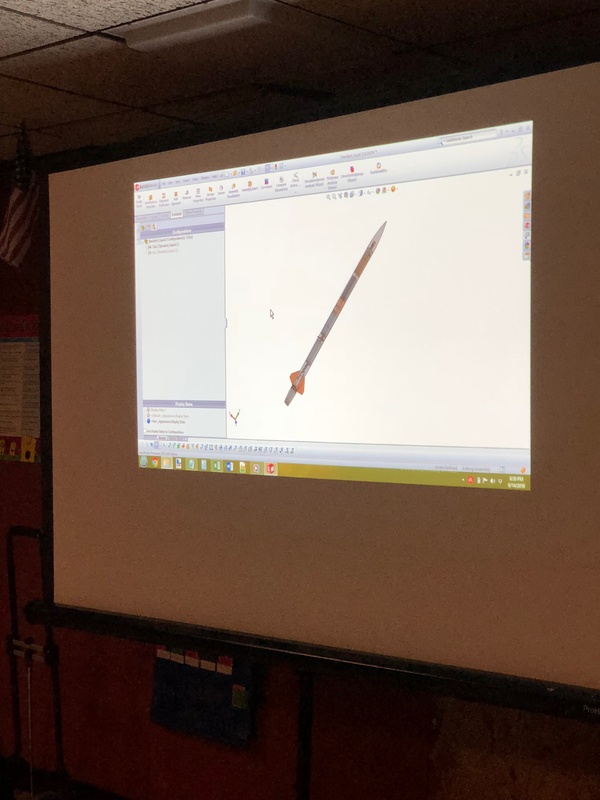 Richard put a lot of work into this first design which helps pave the way to the RRS standard liquid rocket project which will remain a regular topic with the RRS moving forward. Richard then moved into the details of integrating a liquid motor into a rocket body. Using commonly available parts and a few simply made connecting pieces, a simple but effective liquid rocket design can be made with a modest budget easily affordable to universities and individuals. This is still a work in progress, but the RRS is committed to bringing this project to fruition. We look forward to the next engine build which will likely be in a series of builds that will ultimately lead to the RRS standard liquid rocket design. We had a very short discussion about the RRS expanding our roster of pyro-ops. Chris Kobel of ROC presented at our August meeting and gave a lot of practical advise on this subject. Many of our next member “class” including myself have already written their rocket resumes to describe their experience with rocketry and have begun soliciting licensed pyro-ops for recommendation letters which is not a task to be taken lightly. Beyond the RRS regular and lifetime membership, the Rocketry Organization of California (ROC) was willing to help RRS members learn and earn their recommendation letters by attending and participating at events at ROC. The Friends of Amateur Rocketry (FAR) have also been very helpful to those of us who are aspiring to be new pyro-ops. 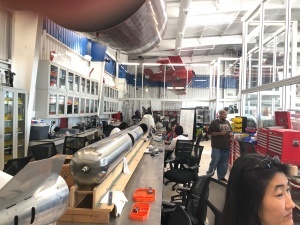 The rocketry community is a small one and it is good to have the support of like-minded organizations to keep the membership across all societies safe, strong and active. ROC holds monthly events on the 2nd Saturday of each month. I have been working on organizing a group of RRS members to go out to the next ROC event to get to know our smoke-and-fire sisters and brothers. To all of our membership interested in making this trip to the Lucerne Valley on October 13th, contact the RRS secretary. If we have a good number of people interested, we can make this a worthwhile trip. This trip would be on the Saturday immediately following the RRS meeting on that Friday night (Oct 12th). ROC will be holding an event with school kids, but if the RRS members bring their rocket resumes we may be able to have a conversation with the ROC leadership and get some advice and training. If we get a few members to ride out, I’ll contact ROC to let them know we’re coming. Please let me know by Friday, September 28th. Next meeting of the RRS will be October 12th, which is always the 2nd Friday of the month. The quarterly update for the SuperDosa project will be part of the agenda as well as several items we did not cover in our agenda. All RRS members are welcome to make suggestions for discussion topics at future meetings. For those wanting to add topics, please let me know. I will post the preliminary agenda topics at the 1st of the next month on the RRS website Forum page. As always, please keep your email and contact information up to date with the society. We’re glad to see so many new members and returning members. Even if you can’t make it to Gardena on a regular basis, just send us a line to say “hello” and tell us how you’re doing. 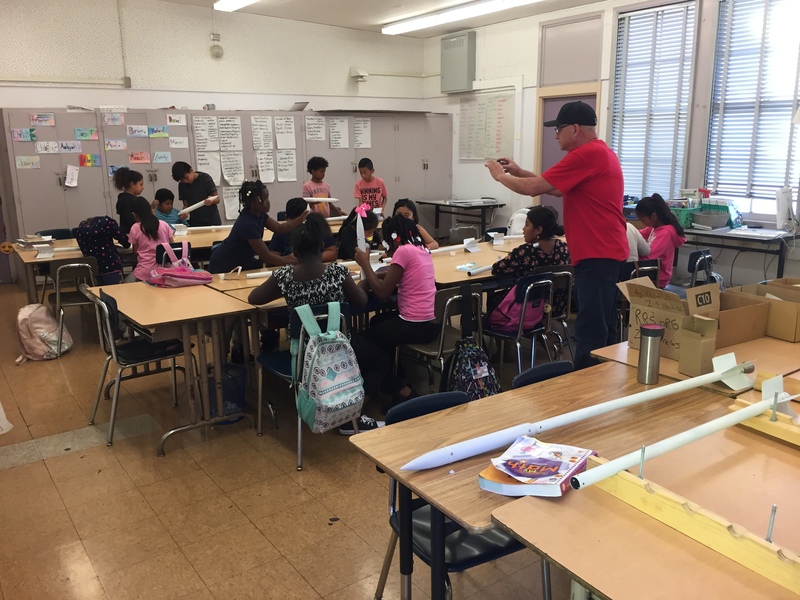 Build Your Own Rocket Event with Spaceport L.A.
Dave on 2017 RRS symposium was a success! tolson on 2017 RRS symposium was a success!